The Jabra GN1216 cord is the solution for Avaya one-X® Deskphone 9600 and 1600 series where microphone volume controls are needed. 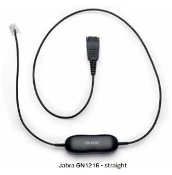 The Jabra GN1216 cord has been designed to offer unique connectivity and support wideband sound. All this at an affordable price. Now your choice of headset is no longer limited by the telephone system. With the Jabra GN1216 cord you are able to connect a range of Jabra’s most popular professional Jabra headsets dedicated for all-day use in even the toughest environments. And best of all, the Jabra GN1216 cord represents an extremely affordable solution for Avaya one-X® Deskphone 9600 and 1600 series. Jabra GN1216 features eight microphone volume settings ensuring no Jabra corded headset is too high or too low. Simply connect the Jabra GN1216 cord and Jabra headset through the Quick Disconnect plug and set the microphone level to your preference. The new Avaya one-X® Deskphones, at present the 9600 and 1600 series is being introduced across all Avaya phone platforms. The phones have headset ports but they need the Jabra GN1216 when using a corded solution. Wireless products all work well on setting “A” and amplifiers like the Jabra GN8000 and Jabra GN8210 also perform well. The problem with these phones is they have a very special interface which includes an AGC and a sound level protection. If the headset microphones are slightly too quiet the customer will hardly hear anything and if the microphone is too loud the phone will disconnect the call. The Jabra GN1216 solves this and works with all our headsets. It has a setting for each different headset. The cord will only work on the above phones and is not a “universal” solution like the Jabra GN1200. The settings vary depending on headset type.